We've been blessed to be able to try out several different kids' Bibles here. We've loved all of the ones we've received. Each Bible has it's own unique character and additions that make them interesting for kids. This one was pretty nice as well. The May the Faith Be With You Holy Bible from Zondervan would be good for kids around ages 7 - 13, I would think. 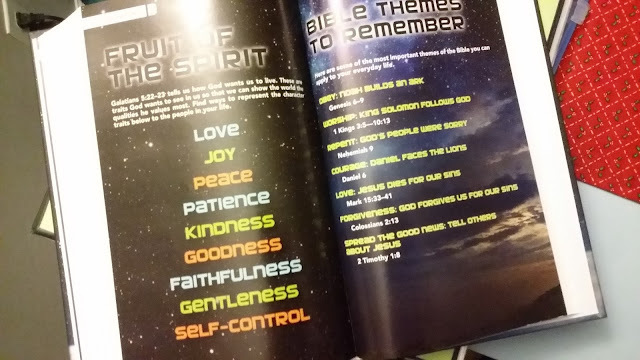 I think it would be a great "Bridge" Bible for kids who are too old for the Storybook or Picture Bibles of younger kids, but who aren't quite ready for an adult Bible yet. Affiliate Link--If you purchase through this image, I might make a small commission. The Bible was a little different than I expected. 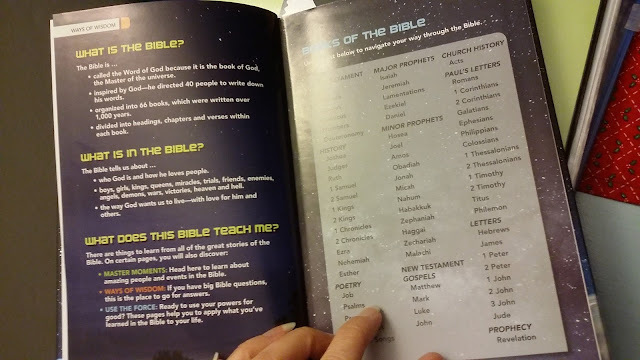 I guess I thought that since it was a kid's Bible there would be more pictures, like some of the other Bibles we've reviewed in the past. What won me over about this Bible though, was the version. The May the Faith Be With You Holy Bible is the NIRV version. I had never heard of this version before. My favorite version for myself is the NIV version, so I was familiar with that version. NIRV stands for New International READER'S Version . It is based on the NIV version, but is much simpler to read for new readers. 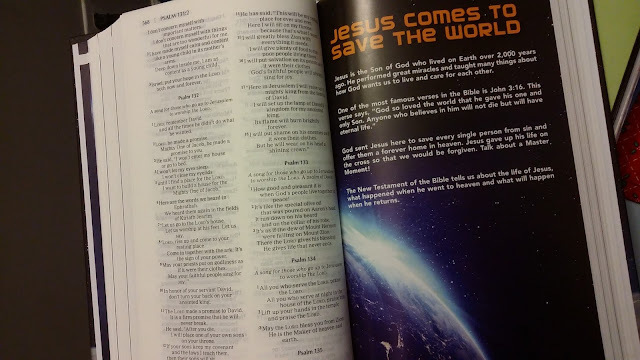 The sentences are shorter than the regular NIV version, and the sentences are written in an easy to read language and format. Once I had flipped through and started reading (instead of searching for the pictures! ), it all made more sense to me why this was a kids' Bible. The Books of the Bible, separated into sections: Law, History, Poetry, etc. What were the Parables of Jesus? There is also a dictionary in the back and a list of interesting Bible stories and where to find them. The May the Faith Be With You Holy Bible is available at Amazon, Christianbook.com, Target and Barnes and Noble. This post may contain affiliate links. If you use the links, I may make a small commission.